Available with mounting plates and modular mounting frames. Suitable for aggressive, marine, corrosive and chemical environments. 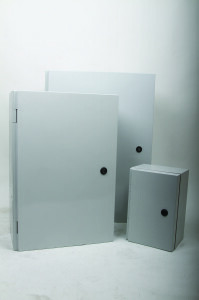 CE-TEKs AR series of maintenance free GRP cabinets are rated to IP66 and IK10. These robust designs can withstand severe climate conditions within a temperature range of -50ºC and +150ºC and are suitable for corrosive, marine and chemical environments. Typical applications include: commercial and leisure sites, fuel stations, market centres, harbours, construction sites, shipyards, mining, food and beverage, water treatment and waste management plants, telecommunications, public transport, energy distribution and utilities. Optional extras include: mounting plates and modular mounting frames, wall and pole mounting brackets.